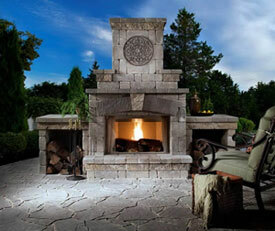 At Accurate Pool & Spa we offer swimming pool and hot tub sales, service, and installation in South Eastern WI. We are a fully licensed and insured swimming pool contractor. 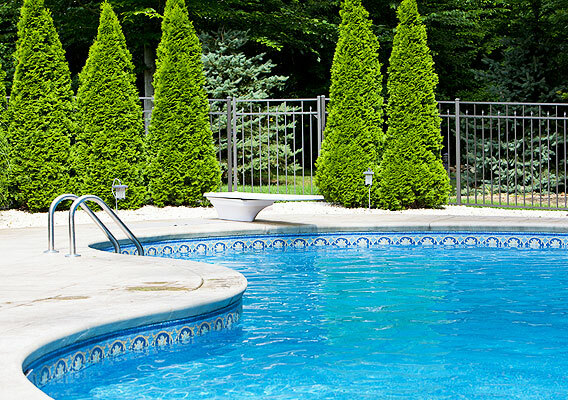 We have over 25 years of experience in the swimming pool construction and service industry. Join us on Facebook, Twitter, and LinkedIn to learn more about Accurate Pool & Spa services and to be the first to find out about upcoming promotions! It is time to replace your in ground swimming pool liner and you have come to us in search of information. We’re glad you’re here. You may be asking yourself, what is the most important issue to consider? Is it price? Liner pattern? Length of warranty? Thickness of the in ground vinyl liner material? Which pool liner brand to choose? In reality, it is none of these. Instead, the most important decision is which local swimming pool contractor you are going to hire to measure, install and stand behind the purchase of your new in ground vinyl pool liner. Every other decision can just be a distraction. If you hire someone who misses one measurement, you may spend the next 10-15 years looking at wrinkles. If you let someone who is inexperienced install your pool liner, you may have a pool liner that will fail early on. If you buy from someone out of town or who is not around in a few years, you will have no advocate to make sure your warranty claim is treated fairly in case there is a problem. It is your local swimming pool industry professional who lives and works in your community that will guarantee your satisfaction. Choose that contractor wisely. Nothing else is more important. Liners must be replaced every 5 years and cost $10,000.00 to replace. FALSE The average life of a vinyl liner is 10 to 15 years with many lasting even longer with proper care. While it is true that they may need to be replaced sooner due to improper water chemistry it is not likely. The cost of replacing the liner with labor and material usually starts at $3,000.00 and goes up depending on size, features, and thickness. Liners rip and tear very easily. FALSE While it is true that you can tear and rip a liner, it is very unlikely that this will happen through the course of everyday use. If you do happen to have a small hole, they are very easy and inexpensive to repair. Maintenance cost for 10 years is over $11,000.00. FALSE Chemical usage and electricity usage is no more than any other pool. Depending on the type of sanitizer used and the circulation equipment installed, they are just as easy to take care of as any other pool. Vinyl liner pools look cheap. FALSE Many things have changed over the years in the industry. A vinyl liner can still be built with the basic white coping and white step, which does give the appearance of a less expensive pool. Although it can also be built with steps and benches in the pool with the liner being custom made to fit right over them, this gives the same look as a fiberglass or concrete pool. There are also many different decking options available such as travertine, pavers, cantilever concrete and stamped concrete. Vinyl liner pools are only available in rectangular shapes. FALSE While the majority of vinyl liner pools built today are rectangular, you can have a Vinyl liner pool built to any shape you can imagine. Vinyl liner pools are only 8 feet deep. FALSE You can have any depth and any type of slope that you want with a Vinyl liner pool. They are the best value for your dollar! 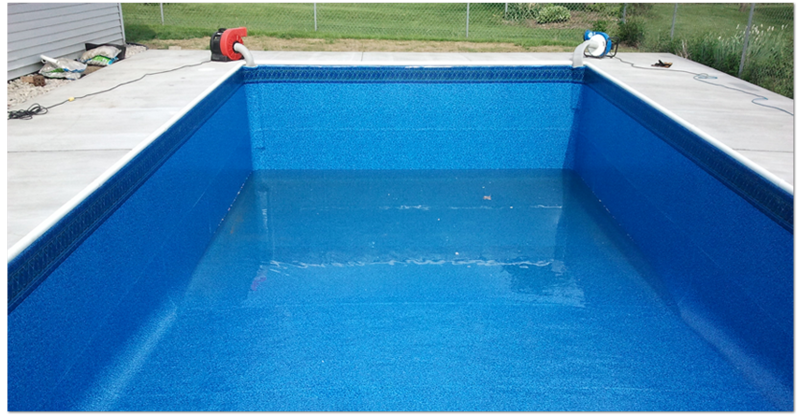 A quality vinyl liner pool is usually a minimum of $10,000.00 less than a fiberglass or concrete pool. The liners will need to be replaced every 10 to 15 years. This cost is less expensive than re-plastering a concrete pool or refinishing a fiberglass pool. The interiors are very friendly to your skin. They have great foot traction and feel great to your skin. The designs and options are endless. 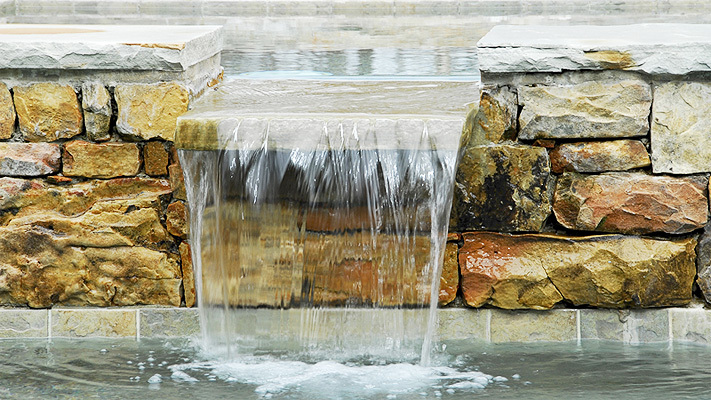 They can be built to any size and any depth, with steps, benches and ledges in or out of the pool. There are numerous choices for liners, usually at no additional costs. You can pick just about any color and many different faux tiles. 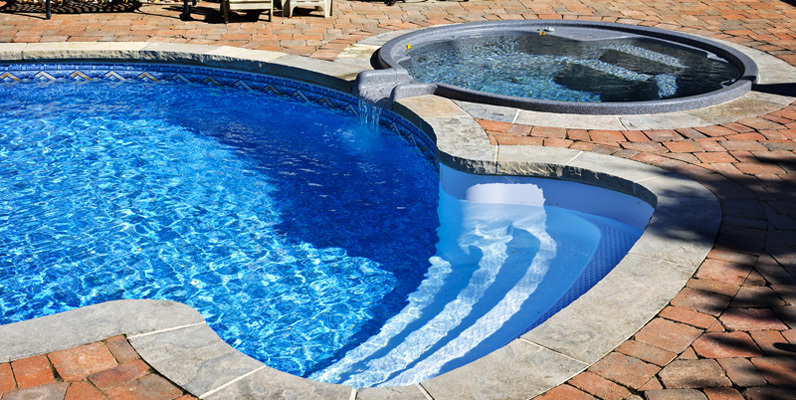 Vinyl liners can even include such features as real waterline tile and can even be built as an infinity pool. There are many beautiful Vinyl liner pools built that many people think are fiberglass or concrete. Hopefully by now you have chosen Accurate Pool & Spa Services. Over a thousand in ground pool owners have already made this choice. We have seen the good, the bad, and the ugly; which gives us a special perspective that we bring to each in ground vinyl liner order. After the initial consultation and measure, we review it and look for anything that does not make sense. We ask a lot of questions and you may see us stop back by your swimming pool several times to check “just one more dimension.” The key to a long life for your in-ground vinyl pool liner is a very full, minimal stretch fit, and to do that, the measurements have to be right. Your satisfaction is our only goal! Measuring and installing vinyl swimming pool liners is not a simple task and not just anyone can do it well. Merlin Industries strives to provide the best vinyl liners possible, installed by the best swimming pool contractors in the business. It is the combination of our expertise in vinyl liner replacements and Merlin Industries unsurpassed quality that makes for a great installation. After choosing Accurate Pool & Spa the rest of the decisions are easy. Most importantly, choose a vinyl liner pattern that speaks to you. Your favorite should come to you easily, but choose wisely. You are going to be looking at that pattern in your backyard swimming pool for at least the ten years. It is what you think looks the best that matters. We invite you to view our in ground vinyl liner patterns, see the larger images in our slide show and read our tips for narrowing your pattern choices down to the one that is right for you. You may also click on each pattern to view a larger image. You are probably now asking yourself, is that really all there is to it? The answer is: Yes. The replacement vinyl pool liner process really boils down to just two things: Choose a Contractor and Pick a Pattern. It really is that simple.